If you're looking for a great vacation rental for you and your family, then consider Splash Resort located on beautiful Panama City Beach, Florida. This resort has everything a family needs to enjoy a vacation experience they will never forget. Not only is Splash Resort located on a spectacular beach with soft, milk white sand, cool, clear waters and gorgeous scenery, it also has excellent amenities and easy access to a wide array of great dining and entertainment options, all at affordable prices. When you and your family choose Splash Resort, you'll be on your way to enjoying the vacation of your dreams. No matter the size of your family, Splash Resort has the perfect condos to meet your needs. You have the choice to rent or buy 1, 2, or 3 bedroom condominiums, all with breathtaking views of gorgeous Panama City Beach. The condos are spacious, comfortable, well laid out and have all the amenities you and your family needs to have a truly relaxing vacation. There's enough room for everyone, no matter their age, to carve out their personal space and have a great time. The condo’s late model appliances, nearby food shops, and comfortable furniture, mean you can have everything you need to prepare and enjoy wonderful family meals. The real estate on which Splash Resort is built is in a great location that provides you with easy access to excellent dining choices. Whether you are looking for fine dining, exotic dishes or familiar fast food places, it's all within close proximity to the resort. There are dining establishments to suit your every mood, sure to please the palette of even the pickiest eaters. The smiles on the faces of the entire family when they sit down to eat in the wonderful atmosphere of the restaurants in and around Splash Resort will make it abundantly clear you made the right choice to spend your vacation here. Having fun at Splash Resort is easy because they have so many exciting things to do. There's a fabulous water park that children and adults of all ages are sure to love. Plus, there's a dive-in movie theatre showing great movies that will entertain the entire family and make their vacation even more fun. Parents are sure to love the bar and grill, conveniently located poolside, where they can experience tasty dishes and sip exotic adult beverages. Visitors also rave about the wonderful time they have floating idly down the resort's lazy river. All of this is available at a price you don't have to sell a home to afford. 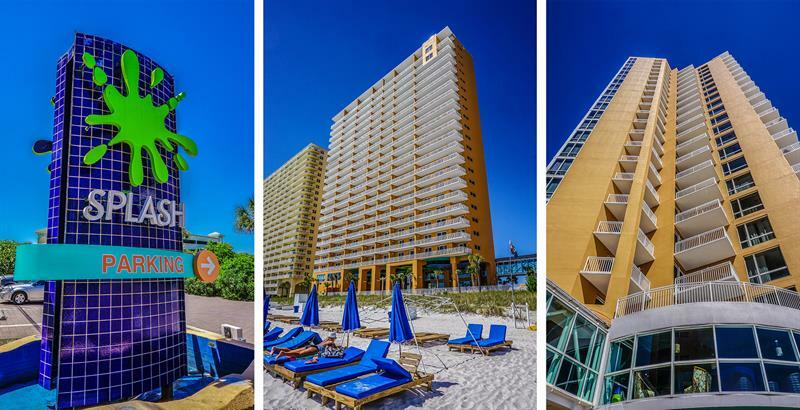 Access to the amazing Panama City Beach Splash Resort offers alone is reason enough to vacation there. Your family can spend endless hours frolicking in the sand, sun, and surf this historic beach offers. Guests can wade in the shallow waters, body surf on the waves, swim to their hearts content, build sand castles in the smooth, silky, sand or simply lay on a blanket and soak up some sun. If you want to add some more exciting adventures to your beach vacation, there are a wide range of water sports for you to enjoy. At days end, you want walk along the beach and enjoy a spectacular sunset. There are so many fun activities at Splash Resort you may even want to buy a home there and never leave. Your children will have permanent smiles on their faces when they see all the ways they can play at the interactive Aqua Play pools, designed purely with children in mind. It features a whole host of water slides, along with countless fun, and exciting and innovative spray toys. Plus, toddlers will love the Lil' Tot Splash Pad. The entire family will be laughing out loud and screaming with excitement as they explore wide array of exciting games for all ages at Splash Resort's beachfront arcade. Splash Resort has set a high standard when it comes to Gulf Coast family vacation destinations. Young children, teens, parents and even grandparents will all joyfully remember the fun times they had at this awesome beachfront resort. Make your family plans to visit Splash Resort today. When investing in a property intended for rental purpose, it is ideal to purchase that property in an area with a lot of activity. Will the unit be rented on a monthly/yearly basis? Or will the unit be available for weekend rentals by families from other areas? At Splash Resort the demand is high for daily and weekend rentals for people looing to relax and let the kids play on the beach. The return on the investment will vary over time and how the property is put to use. Location is everything and Splash Resort Condos has a prime spot on the Florida coast. Feel free to browse all Splash Condos available for purchase today.